The son of Oakland Council President Larry Reid faces up to 20 years in prison and $750,000 in fines. 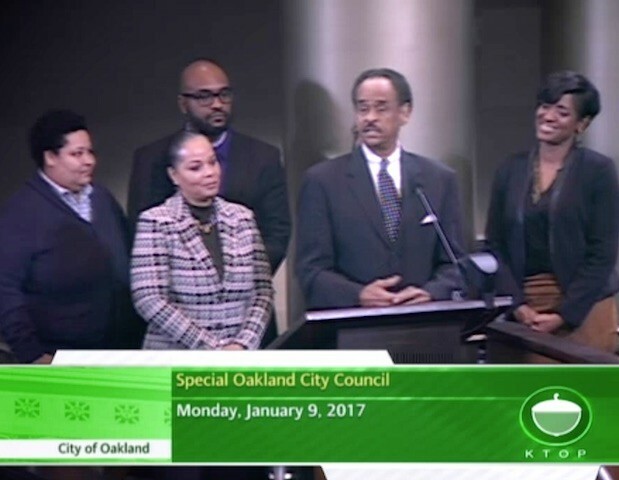 Taj Reid stands behind his father Larry Reid at an Oakland City Council meeting in 2017. A federal jury found Taj Armon Reid guilty yesterday of conspiring to rig state construction contracts and accepting bribes. Reid, who is the 47-year-old son of Oakland City Council President Larry Reid, was convicted on three counts, which could carry a sentence of 20 years imprisonment and $750,000 in fines. The case began over six years ago when a mysterious out-of-state businessman calling himself William Joseph came to the Bay Area looking for opportunities. Joseph sought out meetings with public officials in San Francisco and the East Bay. One of his first get-togethers was with former San Francisco School Board member Keith Jackson. Jackson already had an undercover FBI agent building a case against him (as well as state Senator Leland Yee), and Jackson would later be taken down as part of the FBI's sprawling "Shrimp Boy" undercover sting. But before all of that, the undercover FBI agent who called himself "Michael King" introduced Joseph to Jackson. Joseph said he was interested in getting into Oakland's medical marijuana industry. Could Jackson make any useful introductions? Jackson ended up introducing Joseph to Taj Reid, the son of Oakland City Council President Larry Reid. Joseph, who said he specialized in construction and real estate, met several times with Reid and his business partner Eric Worthen in San Francisco in early 2013 to discuss government contracting opportunities — not cannabis. Joseph talked himself up as a big player in the real estate realm. He said he'd done projects at Disney World and Universal Studios and built part of the Dallas Airport. He was looking to buy a giant franchise of TGI restaurants in Texas. He claimed to have owned an auto dealership through Toyota's minority business program: Joseph is Black, and many of his meetings in the Bay Area were with other Black political and business leaders. He would tell people that he "got a whole lot of shady friends with cash" who help him out when he's in a pinch, according to court records. And Joseph said that Michael King, the undercover FBI agent who had already been making rounds in the Bay Area and posing as a super-wealthy ex-Wall Street type, was one of his sources of financing for really big deals. Unbeknownst to Worthen and Reid, William Joseph was actually William Myles, a confidential source whom the FBI has paid for years to root out public corruption across the country. Myles has helped the FBI build cases against politicians and police officials in Connecticut and Louisiana. At the time they met with the FBI's Myles, Reid's business partner Worthen was a high-level employee within the state Department of Veterans Affairs, or CalVet, working in the division that builds housing for veterans. On the side, Reid and Worthen ran a consulting business. Prosecutors alleged that Worthen and Reid devised a plan to use Worthen's position inside the state agency to obtain non-public information about a Southern California CalVet housing project that was being put out to competitive bid. Worthen and Reid promised Myles that they could ensure he would win the contract. In exchange, they accepted about $12,000 in bribes. "We want you to have the job, we want to make sure you get the job," Reid told Myles, according to FBI records introduced at trial. "Let’s keep this on the hush." Worthen and Reid also requested a 15 percent share of the profits that Myles stood to make off the construction project. According to the FBI, Reid went to San Francisco in April of 2013 to meet with Myles in his hotel room and accept a $10,000 bribe. Not long after, Worthen and Reid devised a similar scheme to help Myles pursue a kitchen construction project in Los Angeles that was also being built by CalVet. Again, they provided him with non-public information about the project and took $2,000 in compensation each. Then Myles did what the FBI pays him to do. He asked Reid and Worthen to introduce him to more people who could provide even bigger opportunities. Reid — who according to federal prosecutors told Myles, "If you want to play, you have to pay" — ended up introducing the FBI informant to his father, Larry Reid. But although the FBI was rumored to be investigating Larry Reid, the councilmember was never accused of any wrongdoing by the feds. Instead, it was another introduction that led to still more criminal charges and the fall of several influential Oakland businessmen. Following up on the request from Myles, Reid and Worthen reached out to their friend Ken "Kenny" Houston to see if Len and Lance Turner, two brothers who own the Turner Group Construction company, might have any interest in meeting the wealthy out-of-town businessman. Houston, who is currently running for mayor of Oakland, is a close friend of Larry Reid and also a project manager with Turner Group. The Turner brothers have done major business with the city of Oakland. According to court records, Houston told Reid and Worthen that they should all arrange a meeting. To entice the undercover FBI asset Myles to meet with the Turners, Reid told him that "they got juice through Dad. They got a lot of work. More out there for them to get," according to FBI records. Federal prosecutors alleged that this was a reference to the $2 million in construction contracts that the Turner Group company was seeking from the city of Oakland at the old Oakland Army Base. Oakland's city auditor found in 2013 that Larry Reid improperly interfered with the process of awarding these contracts by putting pressure on staff to give the work to the Turners. Myles showed up one afternoon in May 2013 at the Turners' East Oakland offices and sat down with Len Turner, Taj Reid, and Worthen. This was the day after Reid accepted a $2,000 bribe from Myles for the CalVet scam. The meeting was brief, and according to the FBI, no one proposed any illegal schemes during the 30-minute conference. In fact, some of the discussion centered on how to create more job opportunities for minorities. Months passed after the meeting with no further business discussed. Even so, the FBI decided to set up an elaborate sting targeting Len Turner and his brother Lance. The sting started when Myles contacted Taj Reid in September 2013 and told him that he had an inside track to get a multimillion-dollar construction project at the Lawrence Berkeley National Laboratory, but he needed other contractors to submit fake bids at higher prices in order to win it and help his inside connection cover their tracks. Federal prosecutors allege that the Turners agreed to submit a false bid. In fact, the Department of Energy was in on the FBI's fake bidding opportunity, and prepared a fake construction contract for the operation as bait. Records produced at trial showed that Turner Group Construction did, in fact, submit a bid to the Department of Energy on September 13 for the work in question. Myles promised to compensate the Turners for the allegedly false bid by hiring them to subcontract on the project. And for his part in making the introductions and serving as a go-between, Taj Reid demanded a $100,000 cut from the Turners, according to court records. "I brokered the deal. I gave you the deal," Reid allegedly told Len Turner after Turner expressed outrage at the councilmember's son's high price. "I spoon-fed you the deal. You didn’t have to do nothing [...] All I want to do is get paid," said Reid. Alongside Reid, both Len and Lance Turner were charged with conspiracy to defraud the federal government. They have both pleaded innocent and are both facing five years in prison and $250,000 fines if convicted. Throughout the case, defense attorneys for Reid, the Turners, and other defendants swept up in the FBI's sting have stated that the operation has all the hallmarks of entrapment, and that most of the FBI's targets were prominent Black business leaders and politicians. They've alleged that the FBI came to the Bay Area and racially profiled people in its public corruption probe. Attorneys for the Turners wrote in a recent court briefing that they believe the FBI informant Myles specifically targeted their clients because they were Black. Furthermore, they wrote that the FBI has a history of using Myles "targeting of blacks for sting operations" because he poses as a successful Black entrepreneur who wants to help uplift Black communities. The Turners were lured into doing business with Myles by "false appeals to racial solidarity," wrote the defense. "Mr. Joseph, under that alias and others, has spent the last decade as a well-paid operative of the FBI, earning over a million dollars endeavoring to persuade African Americans, most often public officials, to commit criminal offenses. The tool of his trade is lying, at which he is quite skilled. In addition to false claims of great financial resources and professional achievement, the CHS’s lies often involve heartfelt descriptions of his intention to serve the interests of the local African American community." U.S. District Court Judge Charles Breyer denied the motion last month. The Turners are awaiting jury trial and will argue that they were entrapped by the government. Reid has yet to be sentenced.